New Delhi, 8 February, 2017: There is no greater high than being in love. Taking this feeling a few notches above, city’s favorite lifestyle destination DLF Place, Saket is all geared up this Valentine’s Day with some heart-warming offers and exciting activities from 4th to 19th February, 2017 which will melt your heart. To make your Valentine week more memorable, the mall has come up with a special concept of ‘8 Days, 8 Ways to express your love’ starting from 7th to 14th February, 2017. Celebrate Rose Day with gift vouchers from Costa Coffee. Propose to your partner on Propose Day with movie tickets from Cinepolis and give him/her a sweet surprise with chocolate popcorns from 4700BC on Chocolate Day. Pamper your partner with gift vouchers from Archies, this Teddy Day and gift them a promise of beauty with beauty products from Vert. Amuse your partner with the special travel pack from KAMA Ayurveda on Hug Day. To make the Valentine’s week even more special, Affinity salon will give you a chance to impress your partner with their 30 min wash and blow dry offer this Kiss Day. Making this Valentine’s Day memorable for your partner, choose from the unique collection of clocks from Medieval India and swoon their heart away. 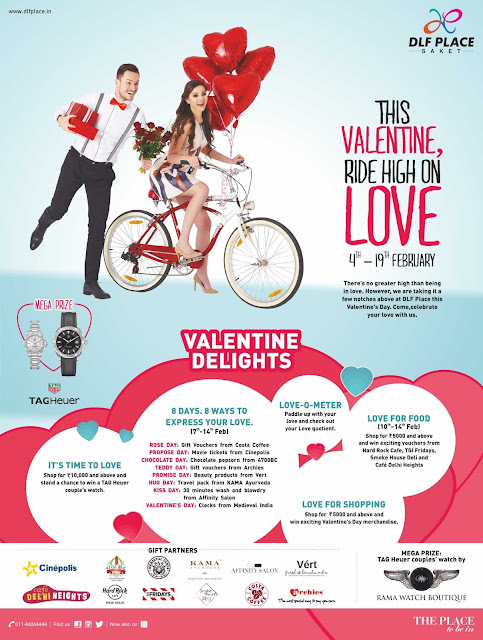 Taking Valentine’s Day celebration out of the ordinary, DLF Place, Saket has currated a special Love-O-Meter challenge. Paddle up with your love to check out your love quotient and astonish your partner by showing your love. Make your evening more special, shop for Rs. 5000 and above between 10th to 14th February and win exciting vouchers from Hard Rock Café, TGI Fridays, Smoke House Deli and Café Delhi Heights and treat your beloved with some amazing cuisines. Spreading love all around, DLF Place, Saket has come up with some exciting offers for all the shopping lovers. Shop for Rs 10,000 and above and stand a chance to win couple watches from TAG Heuer. Also, shop for Rs. 5000 and above to win exciting Valentine’s Day merchandise.